At first glance, you'd think Destyni Tyree leads a charmed life. She was voted prom queen by her peers and was captain of the cheerleading squad. She also completed high school in two years, earning a 4.0 grade point average and snagging a full-ride scholarship to Potomac State College of West Virginia University. But behind the work ethic and will to succeed is a difficult upbringing, an adolescence marred by anger and fist fights, and the reality of living in claustrophobic conditions with 243 other families in one of the most notorious homeless shelters in Washington, D.C.
Tyree’s mother lost her job a couple of years ago, and the family struggled to support itself in a city with sky-rocketing rent and ever-increasing cost of living expenses. They made the difficult decision of moving into D.C. General, the city’s largest homeless shelter. The stress of the environment bubbled over into Tyree's academic life, forcing her to pull out of various schools. “I had a lot of issues with classmates and teachers. It was just too much,” she said. It wasn’t until she enrolled in Roosevelt S.T.A.Y. High School, an alternative program, that she felt motivated to succeed. “As a student, she is a natural-born leader,” said Eugenia Young, principal of Roosevelt S.T.A.Y. High School. “She is a joy to be around, she has a good heart,” Young added, calling Tyree a “bubbly person” and a “phenomenal” student. Tyree managed her academic achievements in a tireless manner, taking on heavy loads of classes, including on Saturdays, and working 25 hours a week at an ice cream parlor. On top of the long days, she was involved in many school activities, launching the school’s first cheerleading team, organizing a senior trip to an amusement park and asking Young to host a senior prom. "I just time managed," Tyree said. "I just wake up and do what I gotta do." “The more and more she’s around people who constantly tell her how smart she is, and how she can do anything she puts her mind to, the more she believes she can do anything now,” Young said. 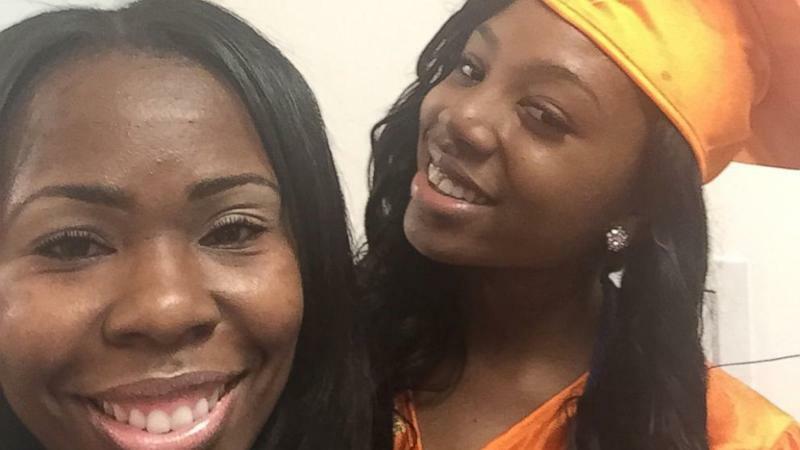 Tyree’s motivations in graduating early are grounded in her role as a big sister, saying she wants her little sister to always have someone to look up to. But -- she's also ready to spread her wings, she said. In a recent survey taken on a single night in January 2016, 12,215 people throughout the metropolitan Washington region indicated they were homeless, a 5 percent increase from 2015, according the Metropolitan Washington Council of Governments. The national numbers of homelessness are even starker: 1.3 million students in the U.S. were homeless in 2013 to 2014, according to federal data. But Tyree refuses to be just another number. “We’re not a statistic and we’re not all the same,” she said. Her goal is to one day give back to the community that helped raise her by becoming a school principal. Tyree starts school at Potomac State College of West Virginia University in August.